Any quantity only $6.98 per oz over spot! Ancient Egyptian deities and designs have become a popular theme in the Monarch Precious Metals catalog. In particular, the American mint has been issuing silver rounds in fractional weights with ancient patina and designs that ensure no two silver rounds are exactly the same in appearance. 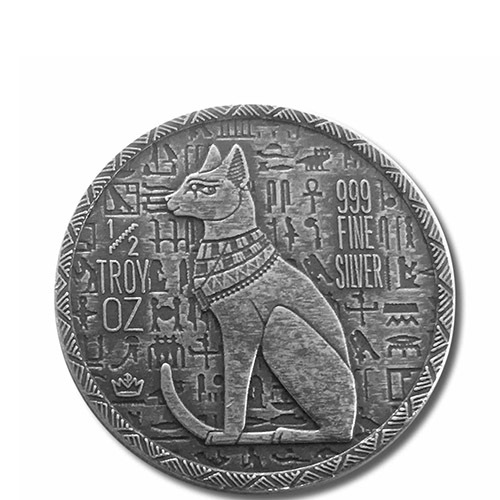 Right now, 1/2 oz Silver Monarch Egyptian Cat Goddess Bastet Rounds are available to purchase online at Silver.com. Rounds ship to you inside of zip-top bags or natural linen drawstring bags for multiples of 20 rounds! One of many Ancient Egyptian designs from Monarch Precious Metals! 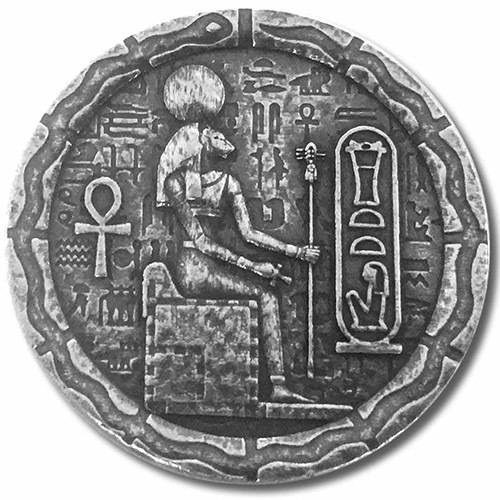 On the obverse is the goddess Bastet along with the hieroglyphs spelling out her name. 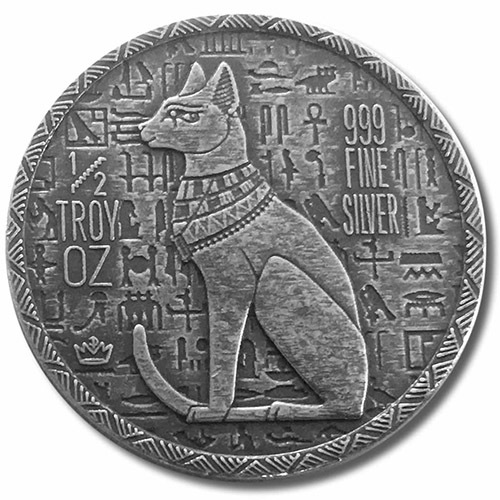 The reverse face of the silver rounds includes cat, the symbol of Bastet. Each 1/2 oz Silver Monarch Egyptian Cat Goddess Bastet Round in this listing has an antique patina and “anti-polish” application that deliver old-world charm and the appearance of ancient coinage to a product that is brand new. Monarch Precious Metals struck each of these rounds in ultra-high-relief. An ultra-high-relief round is one which is struck with intense pressure during production, which results in design elements with impressive 3D display and a sunken background field. Monarch Precious Metals purposely struck each of the designs on these rounds individually to ensure that no two are exactly the same in appearance and positioning. On the obverse of all 1/2 oz Silver Monarch Egyptian Cat Goddess Bastet Rounds is the depiction of Bastet as she was featured in later Egyptian hieroglyphs. Her right-profile portrait includes the figure of a woman with the head of a cat, and the hieroglyphs in front of her face are those which were used to spell out her name. Bastet was originally a goddess of warfare to the Ancient Egyptian people of Lower Egypt during the time of the Second Dynasty in 2890 BCE. As various Egyptian cultures existed at the time though, there was crossover between cultures in deities and their roles. As cultures merged between her original appearance and the 22nd Dynasty (945-715 BCE), Bastet became associated with other deities of the same role from cultures which used a cat to depict the deity with her powers. Bastet was eventually relegated to lower deity status, and her figure was depicted as a woman with a cat’s head. The reverse of the Silver Monarch Egyptian Cat Goddess Bastet Round features the image of a cat. This became the symbol of Bastet as early as the 18th Dynasty when Thebes became the capital of Ancient Egypt and power among the priests of the temple of Amun resulted in the elevation of local deities over all others. If you have any questions about buying silver, please feel free to ask. Silver.com customer service is available at 888-989-7223, online using our live chat, and via our email address.